Quinoa salad is an original alternative to the salad recipes we usually prepare. It is not only an original alternative, but a very healthy one with a high nutritional value. However, quinoa also has a higher caloric value than other seeds. So, you may ask, why cook quinoa? Well, because it has a high composition of proteins, many vitamins and minerals, and it does not contain gluten. I leave this link here so you can read more about the properties of the quinoa and in fact, also just in case you did not know what the quinoa is. 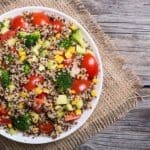 Among recipes with quinoa, the salad is my favorite for warm times of the year, so refreshing and easy to prepare. Cooking quinoa in salad It is a healthy alternative to the salads that we usually prepare. 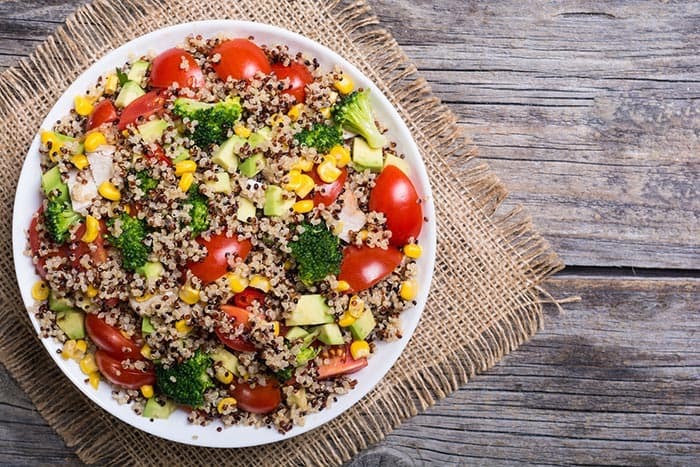 Quinoa is an ingredient high in calories but also in proteins, which makes this salad recipe ideal for a balanced diet.It is important that it be a firm tomato so that it does not lose its consistency and does not fill the liquid salad. These tomatoes are the opposite of those used to make tomato soup. Now let's go with the avocado. It must be ripe so that the meat is soft, but firm enough to turn it into cubes. The avocado is chopped in half. The sharp part of the knife fits into the seed to remove it. In each half, perpendicular cuts are made, such as a grid or grid. Then, with the passage of a spoon flush with the skin of the avocado, the cubes will come out alone. In this link you can see more details on how to cut the avocado. Once cooked the quinoa and the broccoli, we are going to do the following thing: we drain the first one and we cut in pieces the superior branches. In the case of quinoa, you have to strain it. Now pour it into a salad bowl, with the pieces of broccoli, tomato, avocado and corn kernels. Mix all the ingredients, add salt and pepper to taste, add a splash of olive oil and another of balsamic vinegar. We mix everything again and try, in case you need to correct the dressings. And now. Our quinoa salad is ready. Hay to boil quinoa in the same way as before and mix it with a can of tuna in olive oil (already drained) and a couple of hard boiled eggs cut into pieces. You also add the tomato pieces as in the basic recipe, and season with olive oil, salt and lemon. You also have to cook quinoa as before, and mix it with cubes of tomato, onion, green pepper and red pepper. Season with salt, lemon and olive oil. If you already learned how quinoa is made and now you want to try new ingredients, you can check our list of healthy salads or our list of healthy recipes for any occasion.